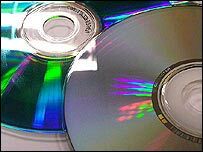 Thousands of fake DVDs and CDs have been seized. Thousands of illegal goods are being crushed in a show of force by the North East Trading Standards Association on Tuesday. Officers are using a McAlpine road roller to destroy over 15,000 counterfeit DVDs and CDs. Boxes of power tools which broke safety provisions and had no instruction manuals will also be crushed. Trading standards officers throughout the North East were involved in the seizures over the past 10 months. The association's chairman, and Redcar and Cleveland Council's chief trading standards officer, Jeff Bell, is supervising the event at Haverton Hill in Stockton. He said: "I think it's time the public got wise to counterfeiting and pushed aside this image of Del Boy characters selling a few hooky products, with only the big corporations getting hurt. "Counterfeiting costs local jobs and takes money out of the Exchequer, thus adding a premium to everyone's tax and rate bills. "At one level, the sellers can be grossing £500 a day while living on benefits. "At the other extreme, there's plenty of evidence to show that counterfeiting is funding organised crime. "The detriment caused by this type of unfair and dishonest trading cannot be allowed to carry on."